Your resource for all things shoegaze and dream pop: Interview: DJ Rav of WZBC Flyweight. How and when did you start being a DJ? Are you also a musician (this seems to be a common trait among DJs)? Flyweight began in 1997 by a former WZBC music director Petrina K. It had more of an ethereal/dreamy sound then. I took over the show in 2006 and began including shoegaze, dreampop, post-punk, psych, C86, drone, darkwave, Madchester, noisepop, spacerock, Krautrock, 80’s alt underground and ambient electronic. Can you tell us what you’ve been working on and what you've got forthcoming in the near future? October is going to be busy. WZBC has its biennial fundraiser that month. I’ll be spinning & presenting The New Highway Hymnal’s debut launch party on October 18th . And Deep Heaven Now (Boston’s psych/shoegaze fest) will be having its 6th festival on October 19th & 20th in Union Square, Somerville, MA. This fest includes Ringo Deathstarr, The Foreign Resort, Dead Leaf Echo, The Vandelles, Stargazer Lillies, and Love Culture among others. Do you feel that the current shoegaze/dream pop scene will last? How do you feel about genres in music, in a general sense? This is by far the best time to be around for shoegaze and dreampop. We have access to almost all of the 80s-90s material through reissues, blogs, and light-shedding on out-of-print releases. For me, the past 2 years have delivered some of the best releases I’ve ever heard, especially for dreampop. Because it’s been around for over 20 years, the genre(s) may seem to lack that out-of-the-package excitement that any scene is awarded when it first coalesces. Otherwise, it’s as healthy as ever. I feel I over-specify genres for my show (see 1st question). And yet when I talk to people who hardly listen to music, never mind college radio or indie, I find myself resorting to terms like Pink Floyd and early U2 to reach common ground. The term “shoegaze” and the definition of what it sounds like today has become harder and harder to pinpoint. Current shoegaze seems to be blurring the lines between itself and many, many other genres - especially electronica, but also plenty of others. Why do you think this is and how do you feel about it? The spectrum across the board is certainly becoming less and less rigid these days. But even in its heyday there was overlap among shoegaze, dreampop, noisepop, and ambient. Diggin’ this year’s releases by DIIV, Screen Vinyl Image, Violens, FWY!, The Lost Rivers, Landing, Disappears, Girls Names, Lumerians, Eat Lights Become Lights and TOY. Looking forward to forthcoming music by Slowness, Weekend, Factory Floor, The Soft Moon, Sulk, Tamaryn, and Spotlight Kid. And will Boards of Canada ever release a new album?? Describe how you typically put together a set for your show. I try to play over 60% new music each week. I source new material from adds serviced to the station, listener requests and postings on Facebook – be it from listeners or band/label/blog pages. Then I hit some “classics” & “obscurities” from each of the genres that makeup Flyweight. Also, I feature an Artist of the Week spotlight every Sunday– up to 175 features now. I generally have Sunday night’s show ready by Wednesday. Flyweight’s playlists and audio streams are archived on Facebook. On the upside, emergent technologies have made it easier for artists to interface with fans, blogs, press, radio, booking agents, etc. As a DJ, this has been tremendously helpful because I can bypass traditional gatekeepers like radio promoters, label reps, journalists, and limited retail access (especially from overseas acts). And social media has allowed me to have direct relationships with small labels, bands and most importantly ZBC listeners. On the downside, Boston lost 3 terrestrial rock radio stations in the past 2 years (WBCN, WFNX, WODS). And college radio licenses have become sellable assets for universities (KUSF’s license was recently sold.) We unfortunately still have Clear Channel, Live Nation, Ticketmaster, RIAA, Apple, Wal-Mart/Best Buy and increasing industry consolidation – models that still benefit a minority of stakeholders. But the major labels have a great trend going: The Big Six to The Big Three to hopefully The Big Zero. I rely heavily on Bandcamp and Soundcloud (and to an extent YouTube) as each allows me play tracks from the artist’s page live on the air. This has bridged the gap to finding those elusive (and expensive) imports or obscure domestic releases. I also like the immediacy these outlets provide. I’ve had bands finish recording on Thursday, faux-master on Friday, upload or email me the wav on Saturday and have it played on Flyweight by Sunday night. You can’t get any more DIY than that. However, I still love the idea of a small label cultivating an identity through its roster and approach to design. Factory, Sarah, Warp and 4AD nailed this in the 80s-90s. Recently, Captured Tracks, Wierd Records, Saint Marie and Sacred Bones have been consistent since their inception. Speaking of consistency, Slumberland may be the greatest record label in the world. Personally, I listen to digital files almost exclusively these days. 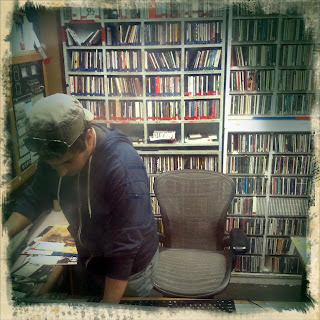 But I still cue up records for the radio show. Can’t imagine Vaughan Oliver, Peter Saville, or The Designers Republic having their legacies without the vinyl format. I always ask bands to send CDs, CDRs or vinyl to our station. It will allow your release to be accessed by all of our DJs. WZBC’s digital management is still in its infancy so mp3s often go into an abyss. In the past couple years it has been the Boston scene that has encouraged me the most. 2012 has been a banner year for us with bands like Ghost Box Orchestra, Avoxblue, Andre Obin, Autochrome, The New Highway Hymnal, The December Sound, 28 Degrees Taurus, The Milling Gowns, Young Adults, Boom Said Thunder, Magic Shoppe, Soccer Mom, Infinity Girl. Heavy rotation on The Gun Club’s “Fire of Love” and The Mighty Lemon Drops “Happy Head”. My girlfriend has been pushing HP Lovecraft on me lately (and A&E’s “Storage Wars”). I’ve been obsessed with 19th century architecture - living in New England allows you to easily geek-freak on the 1800’s. But in summer I generally drop all culture and head up the coast for bodysurfing. Tell us what classic gazer band you’d love to see reform and do a tour. Pale Saints, Loop, Bowery Electric. Your Top 10 Shoegaze Albums? Sorry, but you have to do it! WZBC 90.3 FM is a terrestrial broadcast service of Boston College servicing the metro Boston area and available worldwide online at http://www.wzbc.org. The station began in the AM frequency in 1960 and switched to FM in 1973. In 1979, responding to a vital punk scene, WZBC became one of the first stations in the country to devote its daytime programming strictly to post-punk/college/underground rock (“ZBC Rock”) and its nighttime programming to experimental, abstract, electronic, industrial, avant-garde (“NCP” – No Commercial Potential). Flyweight has been continuously on the air since 1997 spinning shoegaze, dreampop, post-punk, noisepop, psych, C86, darkwave, Madchester, drone and other fuzzed out bliss.